with permission of the Goldstream Gazette. Metchosin is a place for artists of all stripes and their art often reflect the diverse landscapes, fauna, and flora of the region. 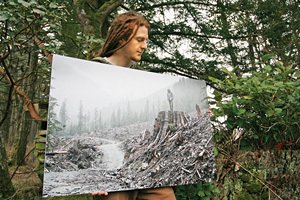 In February, 2011, photographer and Metchosin resident TJ Watt accepted a first-place prize in Outdoor Photography Canada magazine's Human Impact on the Environment photo contest for his image of a man on the stump of an ancient tree in the middle of a Port Renfrew clear cut. The pictures of Metchosin species below are from the Metchosin BioBlitzes and MycoBlitzes. Additional pre-2011 BioBlitz pictures (the ones not labeled "BioBlitz") are Metchosin species pictures supplied by contributors.